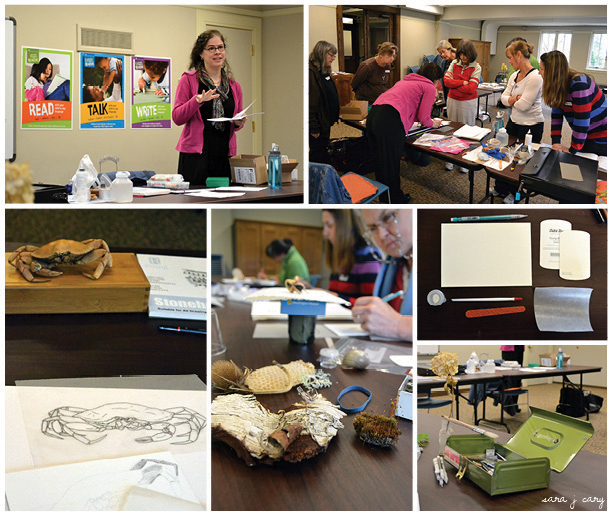 Elieen Sorg GNSI NW Workshop "Mixed Media: How to Create Richly Detailed Art"
This event was attended by 13 people. Topic and Subject: This workshop taught how to use pen, ink, watercolor and colored pencil together to create richly detailed pieces of art. This mixed media approach allows for a quick build up of color and value while still leaving room for the beautiful detail and control of colored pencil. Designed to help students at every skill level to master techniques, design and color, learned watercolor and colored pencil application tips and how to extract the best qualities of each medium in this fun and informative workshop. The subject of the workshop was the crow. Margaret Davidson GNSI NW Workshop "Drawing Draped Fabric"
This event was attended by 14 people. TOPIC: Drawing draped fabric will be the topic to apply to drawing flower petals and other botanical images. SPECIMENS: The presenter provided a small stand and piece of fabric. About Margaret Davidson: Margaret Davidson has a BFA from the University of Michigan and an MFA from the University of Washington. She is both an artist and illustrator, and also teaches courses in Beginning Drawing, Sources of Modernism in Drawing, Aesthetics of Drawing, and various drawing technique classes at Gage Academy of Art in Seattle, Washington. TOPIC: Exploring Puget Sounds intertidal during a minus tide with Seattle Aquarium's Beach Naturalists. SPECIMENS: We found many interesting marine invertebrates and with the help of the naturalists, we were able to identify and learn about Red Rocks Crabs, Graceful Crabs, and Sand Dollars. One of the more exciting finds was a living Lewis Moon Snail. We learned about how it lays its eggs in a sandy collar that is often thought to be a man made object. TOPIC: Before graphite pencils were available, artists drew with metals - lead, silver, gold and others. Discover the subtle, luminous tones of silver drawing, and learn to use this lovely Renaissance technique in your art and illustrations. Susan takes you through the history of the medium and teaches today's techniques for getting the most out of it in your own work. SPECIMENS: Each attendee brought their own natural object to draw. About Susan Jones: Fine artist and freelance illustrator Susan Jones' art has been featured in local and national juried exhibitions; she is represented by Semantics Gallery in Edmonds and Kaewyn Gallery in Bothell, Washington. 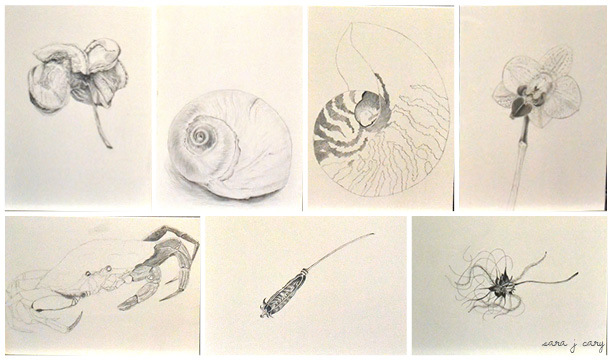 Jones teaches Natural Science Illustration and Botanical Illustration for the University of Washington's Extension Program, and coordinates the Art-Ins, free community art-making sessions at Third Place Commons. For additional information, please visit www.BlueSeahorseStudio.com. The winter newsletter can be found here. Specimens: Working from images of various owls and elephants. Seattle sculptor Bill Evans earned his degree in Architecture at the University of Washington. Exhibiting his work predominantly in the Pacific Northwest, Evans' art has collected numerous awards, including the WCA Juror's Award at Tacoma's Art Stop, Best in Show at Seattle's Washington Potters Association Show, the Jurists Award in the American Society of Architectural Illustrators' International Illustration Competition, Frye Art Museum Watercolor Exhibit Honorable Mention for his Self Portrait, as well as five architectural illustration "Awards of Excellence" in international competitions sponsored by the American Society of Architectural Illustrators. Evans' publications include Surface Design for Ceramics, 2007, and 500 Animals, 2006, both published by Lark Books. In addition, he has contributed numerous illustrations to various other books and publications. 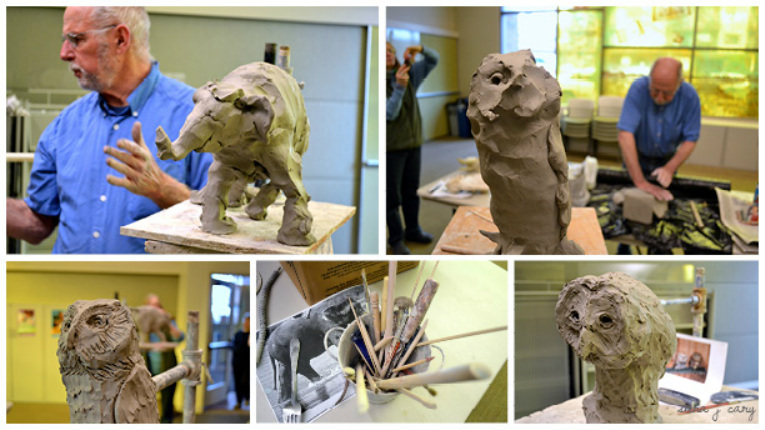 Evans teaches at Cornish College of the Arts and Pottery Northwest, both in Seattle. Evans is represented by Seattle's Sisko Gallery. Meeting and workshop on February 23 from 1 to 5 pm at the Greenwood Public Library. I sure wish Bill Evans had been teaching this approach to sculpture at the University of Washington (UW) back in the days when I was there. Bill's quick starting techniques and easy going manner would have been great to experience then as now. It's an exciting approach in that it gets you in to the piece so quickly, and rather painlessly, as no chance for over thinking. I'm grateful to have experienced UW classes with Everett DuPen, Bob Smith, Patti Warashina (especially), and brief glimpses of Georges Tsutakawa's classes (since I wasn't a declared sculpture major I couldn't attend his classes). Bill's workshop was a very happy time for me. Many thanks to all who made the workshop happen.